I ran into that quote in Srebrenica memorial cemetery written on a beautiful stone that stands in the junction of the path. Being there after listening to Hasan testimony on how he survived genocide, surrounded by families who went to visit their relatives at the cemetery I could not stop thinking about the admirable capacity of survivors to overcome theirs suffering and transform the wrongdoings they suffered into inspiring actions for theirs communities and society in general. 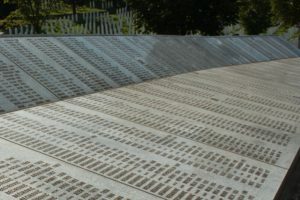 That survivor’s strength and courage is enlightening for society to remember and reflect on what happened, and for individuals to commit to the non-repetition of the atrocities through everyday actions. During these past few days of the Symposium I remembered one of the survivors of the Colombian armed conflict that I have had the pleasure to meet and work with. Her name is Regina. She is a strong and smart afro-descendant woman who lost one her sons in a massacre perpetrated by the paramilitaries in Buenaventura – one of the poorest cities in Colombia and the yet most important Colombian harbor on the Pacific coast. After working with Regina for about two years I came to know about her work on memory, acknowledgement and reconciliation. Her and other parents who lost their sons on the same massacre, after struggling with the suffering of their loss, found a way to heal and remember through traditional celebrations. Two years after the massacre they started commemorating the deaths through the matachines dances, which is a celebration rooted in African traditions. As part of the celebration, they pray for those who were massacred, put up their pictures, talk about their hobbies and dance the matachines that their sons loved so much. Year after year, Regina and the other families have commemorated and found strength to stand up and talk about the crimes committed, who did it and why, information that some part of the Colombian society does not want to know about. Every year, they commit to raise their voices so crimes as such never happen again. When meeting Hasan in Srebrenica I recognized the same strength and courage that Regina and all the survivors have. It is really inspiring how they keep working for truth, memory and non-repetition. Their capacity to transform the wrongdoings they suffered on actions for society to understand what happened, inspire the life of others and contribute to the non-recurrence. Hence, our job as peace builders is to support that great work they do by making sure the scenarios, policies, and actors work together to guarantee acknowledgment and the satisfaction of their rights.